How much does it cost to travel to Alexandria? How much money will you need in Alexandria? E£368 ($21) is the average daily price for traveling in Alexandria. The average price of food for one day is E£140 ($8.15). The average price of a hotel for a couple is E£396 ($23). Additional pricing is in the table below. These average travel prices have been collected from other travelers to help you plan your own travel budget. How much money do I need for Alexandria? There are few cities in the world with a history as rich, deep, tragic and fascinating than Alexandria, Egypt. Founded by Alexander the Great in 331 BC, Egypt's second largest city has seen the most extreme ups and extreme downs. The city watched the beautiful and iconic Alexandria Lighthouse crumble to the ground after several natural disasters. The Alexandria Library housed their most sacred and historical documents only to be burned to the ground. These structures may be physically gone, but the history remains. 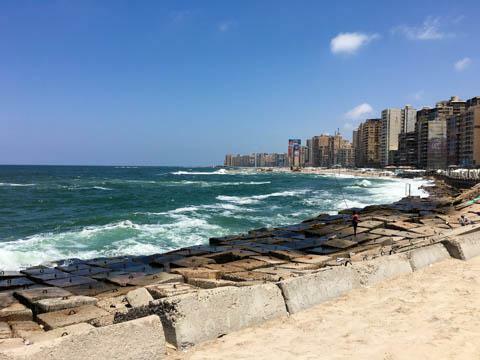 Alexandria is a city with an ancient allure that draws in visitors from all over the world. Alexandria is a survivor city ready for a comeback. Every vacation needs a good beach. Before you venture out to get a healthy dose of history, spend the morning soaking up some sun on the beautiful Maa'moura or Montazah beaches. Most historians have still not accepted the burning of the Alexandria Library. The world lost irreplaceable historical information as it burned to the ground. With the opening of the Bibliotecha Alexandrina in 2002, the city is attempting to rekindle the brilliance of the original. This spectacular collection of museums also plays host to international performers. One of the most iconic spots in the city is the Citadel of Qaitbay. This fortress overlooking the Mediterranean Sea was built in 1480 to protect the city from crusaders. Before it fell, the Alexandria Lighthouse stood here. Today visitors can come to explore the maritime museum. For the adventure seekers in the group, you'll want to take a trip to the Catacombs of Kom ash-Suqqafa. Accidentally discovered in 1990 by a runaway donkey, these catacombs are the largest known Roman burial sites in Egypt. The three tiers of tombs and chambers are carved thirty-five meters deep into the bedrock. If you're dying to see a true, unharmed ancient monument in Alexandria, you're going to have to go see Pompey's Pillar. Built in 297 AD, this 30 meters column presides over the remnants of the ancient settlement of Rhakotis. Rising straight from the ruins of the Temple Serepeum, this impressive column has stood the test of time  making it through centuries to be the only remaining ancient monument in the city. If you simply can't look at any more hieroglyphics, an afternoon at the Montazah Royal Gardens might be just the ticket. The 350 acres of gardens running along the shore are some of the best maintained in the city. There's no shortage of benches or swimming pools open for everyone to enjoy. They also offer a variety of water sports from waterskiing and wake boarding to inner tubing and banana boating. And if you simply need to shop until you drop, Alexandria has you covered. The Souq District is home to rows and rows of market stalls full of produce, fish, meat, baked goods, and more. There are also cafes for a quick shopping break. The Sharia Faransa section of this district is like the Macy's of Alexandria. Here you'll find jewelry, clothes and everything in between. Alexandria is still a tourist-centered town, which means you can find a meal at just about any price to suite any craving. Don't miss out on the traditional Egyptian dishes offered like falafels and fava beans  but especially be sure to try the seafood. It's the best in all of Egypt. Alexandria is a large city, but most places are accessible by public transit. The yellow and black taxis are a convenient and simple way to get around. Be aware, though, that due to constantly changing rates, cab drivers don't use meter. This also means they will gladly take advantage of foreigners who don't know the rates. So make sure you agree on a rate before getting in the car. To flag them down, wave at the driver and call out your destination. Some cars will try to pick you up while they still have other passengers. Don't take that risk, get your own cab. Their tram system is an option, but it's very slow. The cars have been around since about 1860 and the routs can be confusing as they're constantly changing with little notice. The bus system has seen vast improvements, though. Unfortunately, like with the trams, the routes can be very confusing for those who don't live in Alexandria. Taxis are a convenient way to get around the city, but as with anything else in Egypt, you have to negotiate hard. You shouldn't have to pay more than 25LE for any taxi ride within the city. You can also get a taxi for the day so you can tour the sites. For this you will pay 10-15LE per site. If you feel you're not getting a fair rate, find another taxi. It isn't hard to wave down a taxi and they're plentiful. A lot of people breeze in and out of Alexandria, but definitely spend some time here if you can. It's got an interesting cosmopolitan feel and is an interesting counterpart to Cairo. It's definitely not to be missed.